Jo-Wilfried Tsonga moved closer to qualifying for the ATP World Tour Finals by beating fellow Frenchman Julien Benneteau 6-2 4-6 7-6 in the second round of the Paris Masters. The world number eight needs to reach the quarter-finals to make sure of one of the last two places at the showpiece event in London next week. 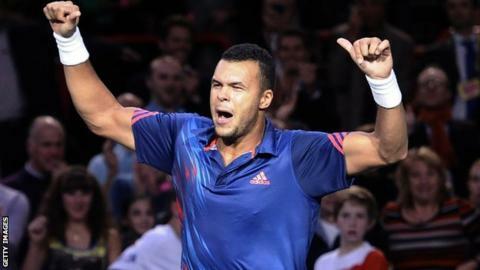 Tsonga will next meet Spain's Nicolas Almagro or Albert Ramos. Marin Cilic, the 13th seed, lost 7-6 6-2 to Poland's Jerzy Janowicz. His defeat ended any hopes he had of competing in London. Tomas Berdych, who has qualified for the Finals, beat Andreas Seppi 7-6 (8-6) 6-2. Six players are already assured of a place in the London event, which will be contested between the top eight players of the 2012 rankings as of 5 November. Rafael Nadal's withdrawal has opened the door for up to seven players who can still qualify, depending on results in Paris. Janko Tipsarevic will definitely qualify if he reaches the final this week, regardless of other results. Anything less will see him reliant on results of those around him in the rankings. Tournament wins for Richard Gasquet or Nicolas Almagro will see them take one of the final places. Other players who could also still qualify are John Isner, Milos Raonic and Juan Monaco. Andy Murray gets his challenge under way on Wednesday when he faces home favourite Paul-Henri Mathieu while world number two Novak Djokovic will play American Sam Querrey.